Do you sprinkle talcum powder after a shower? Some people do that on them and on their kids after a shower. But do you know about the recent johnsons baby powder lawsuit? These incidents highlight the risk of ovarian cancer due to use of talcum powder on the genital area. The link between ovarian cancer and talcum powder was detected in scientific studies as early as 1971.However still there is no health risk warning on the baby powder labels. Talc, which is the main component of baby talcum powder, is a substance which is mined and which contains magnesium, silicon and oxygen. Talc is used in feminine hygiene products such as sanitary pads and diaphragms or people use talcum powder directly on their genital area just because of its ability of absorbing moisture. This will result talc particles to migrate into female reproductive system till the ovaries. Talc particles in ovaries create the risk of ovarian cancer for women. 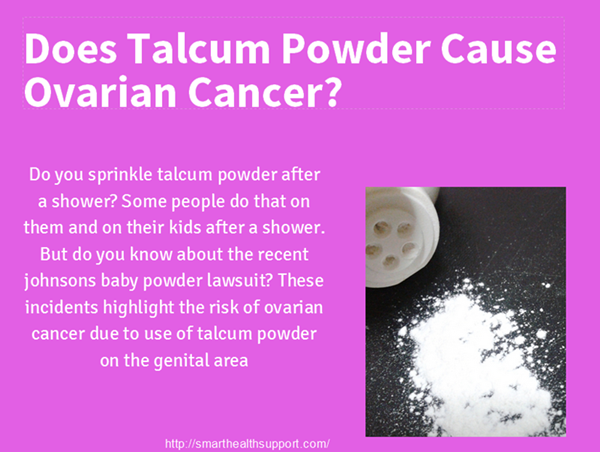 Many researches done before show the connection between the ovarian cancer risk and talcum powder.However still there is no proper awareness about this for the public. According to the studies the risk of ovarian cancer is 30% greater for the women who use talcum powder for feminine hygiene. There are cases of talcum powder cancer lawsuit against the talc mining companies and talc powder producers. The first talcum powder cancer lawsuit was won in November 2013 which was filed against Johnson & Johnson, Luzenac America (a talc-mining company), and Rio Tinto Materials (Luzenac America’s parent company).This lawsuit pointed out the fact that Johnson & Johnson and other talc mining companies neglected educating their consumers about the risk of ovarian cancer due to use of talcum powder. If you use baby powder on your feminine area, it is time to rethink. You can also get the advice from a talcum powder lawyer about your entitlement for compensation, specially if you diagnosed with ovarian cancer.